If your books are in good condition, be there early to get the most for your textbooks. Selling back your books is a great way to battle the rising cost of textbooks. When you sell back your books, you allow others to purchase from a stock of used inventory--saving them a lot of extra money. Do something good for yourself...and your fellow students. Sell back your books today! While we make every effort to give you the most back for your books, don't wait too long--some books have limited quantities being purchased. The condition of the book, national demand, new editions, missing pieces and overstocks can affect the resale value of your books. 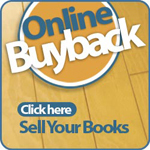 Sell back your books today! Want to know how much your buy back is worth or get alerts to when we're buying your book back at the bookstore? Click Here to search our buy back list or sign up for our buy back notifications.